Photo by Kathmandu Living Labs. CC BY-4.0. The Humanitarian OpenStreetMap Team (HOT), an NGO that works to train, coordinate, and organize mapping on OpenStreetMap for humanitarian, disaster response, and economic development, has mobilized volunteers from around the world to help map since the Haiti earthquake in 2010. HOT's global network has played an important role in events like Typhoon Haiyan and the Ebola crisis in Africa. The mapping data that gets created is often vital for responses to crisis: It is used by first responders such as the Red Cross, United Nations, local groups, and others for planning, logistics, identifying needs, and a lot more. It's safe to say the OpenStreetMap data (and volunteer mappers) play a key role in many responses. Nepal is the most recent example of a large-scale activation, though the leaders of the HOT activation in Nepal were introduced to it differently. For Pierre Béland, it was in Montreal, starting at 5 a.m. on April 25. He woke up to correspond with a colleague in Conakry, Guinea who organized a map-a-thon for the West African Ebola crisis, bringing together volunteers to fill in the map with roads, rivers, and so on so that relief agencies could use the information for planning and logistics. He heard about the earthquake from a colleague from France, Jean-Guilhem Cailton. Jean had already started a Skype coordination room and invited the Digital Humanitarian Network partners, the United Nations, and other international partners to join. The response grew rapidly, with more partners, donor agencies, aid groups, and volunteers wanting to help. Nama Budhathoki, executive director of Kathmandu Living Labs (KLL), a nonprofit that works with mobile technology and mapping in the Kathmandu region, had a more intense entry. KLL has been working for the past few years on a project supported by the World Bank called the Open Cities Project to prepare for such a disaster. They trained local students and community groups to collect information on hospitals, schools, and health facilities while HOT, the World Bank, and others organized volunteers to map the building outlines and road network remotely, using satellite imagery. The on-the-ground mappers in Nepal then filled in the details for those features, saving time and resulting in better data overall. This meant there was already a lot of great detailed data before the earthquake, which is a big help to first responders. Immediately after the quake, and despite losses of power and internet, the KLL team, led by Nama, who is also a board member for HOT, began working, setting up a situation room to coordinate the mapping response, creating and distributing maps for anyone to use, organizing and manning a crowd sourcing platform using Ushahidi to track damage, help wanted, and the like, and set up a clinic to train new mappers. KLL also interfaces with the Nepal government and the UN humanitarian clusters (coordination structures for the international response) and reports their priorities back to HOT. At the same time, the Humanitarian OpenStreetMap community rapidly organized to map the most affected zone, starting a number of "tasks" where volunteers pick an area from a grid and map it so that multiple people can edit the same area simultaneously. This tool, the HOT Tasking Manager, came out of previous disasters and includes tasks like revising and validating the highway network, identifying residential areas, finding open spaces that can be used for helicopter landing zones, mapping displaced persons camps, and more. The imagery for this pre-quake mapping came from Bing and Mapbox. The U.S. State Department's Humanitarian Information Unit provided some as well. Photo by Courtney Claessens. CC BY 4.0. Through email lists, IRC, Skype, social media, and word of mouth, HOT helped connect universities, relief agencies, mappers, companies and a lot more, who organized their own "map-a-thons" around the world to fill in OpenStreetMap. There are dozens of examples, like the American Red Cross and map education nonprofit Maptime in Washington, D.C., the Mapbox office in Bangalore, universities in Germany and Brazil, communities in Tokyo, and many other places around the planet where people decided to do what they can to help by mapping on OpenStreetMap. Since the activation in Nepal, more than 4,300 mappers have made 86,000 edits to the map, adding up to 30,000 roads and 240,000 buildings. At least 2,900 of those mappers are new to OpenStreetMap. This also means there is a need for training those new users—there are a number of great training sites and videos, including the State Department's MapGive effort, the tutorial in the OpenStreetMap editor itself, developed by Mapbox, and the LearnOSM website. HOT staff have been working to ensure that new users are making helpful, accurate edits, and there's also a data validation process where experienced users go through and make sure what has been mapped is accurate. 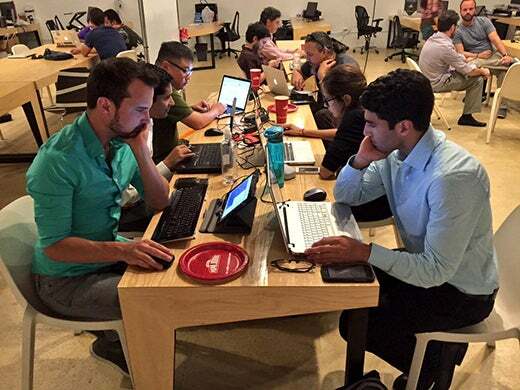 Photo by Rebekah Monson, courtesy of @CodeForMiami and @MaptimeMIA. CC BY 4.0. Post-quake mapping, such as displaced persons camps and helicopter landing areas, relies on new satellite imagery, and HOT, satellite firms, governments and the UN worked together to realign their satellites to take post-disaster imagery. These efforts include the International Disaster Charter, the U.S. State Department's Humanitarian Information Unit, UNOSAT, the UN's satellite agency, CNES, the French space agency, and companies like Digital Globe and Airbus DS. Unfortunately, cloud cover prevented good imagery for a few days—it wasn't until three days after the quake that commercial and government satellites were able to take and distribute good imagery, and in some rainy areas it took a few more days. The crowdsourced response, and all of the involved partners, have done a lot to help—but more help is needed, especially with the monsoon season starting soon. The availability and accuracy of mapping data in the country is key, and if you'd like to help, please check out OpenStreetMap MapGive and LearnOSM tutorials, review the HOT Blog, Nepal Earthquake Wiki page and the HOT Tasking Manager. Pre-mapping was done as usual with the imagery provided to OSM by Bing and MapBox. The US State Department HIU also provided imagery for an area not covered by our base source. Andrew Wiseman & Pierre Béland - Pierre is a coordinator of the Humanitarian OpenStreetMap Team from Montreal. Andrew is a HOT volunteer from Washington, DC.